Equinox Gobo Sweeper LED lighting effect . 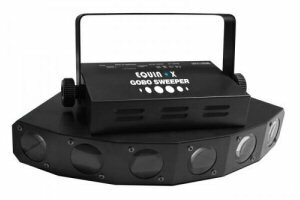 The Gobo Sweeper is equipped with 6 replaceable, removable gobos which produce multi-gobo effects, yet remove the gobos and you have an entirely different effect with solid beams of rich colour. 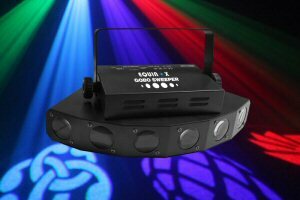 This 2-in-1 fixture gives DJs, small clubs and entertainers the ability to create varied effects without purchasing multiple fixtures. Six 10 Watt Cree quad colour RGBW LEDs (red, green, blue and white) can create a variety of coloured effects, combine the colour strobing effect, 0-100% dimming and built-in programs triggered by the music and you have a ready-made light show. Adding to the flexibility of this fixture is the ability to replace its gobos with your own custom designs so you can use it to project anything from a company logo to the bride and grooms names at weddings.